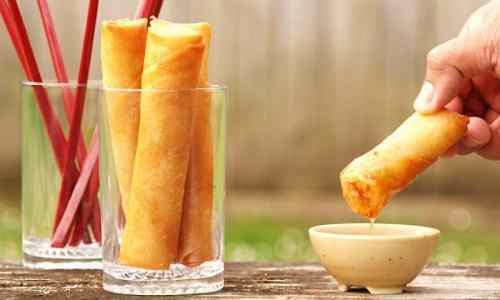 Lumpia… handy pick on the table to meet your simple-to-elegant gauge for a Filipino recipe. This Chinese-taught and –inspired delicacy is great any time of the day. It gives you an easy foodstuff to pick on the table or outdoors. The early Filipinos have learned this cuisine from Chinese traders way back in the 7th century. It is universally called spring roll. 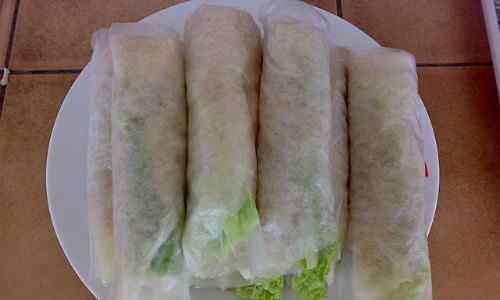 It typically contains fillings made from meat or vegetables and are rolled in an egg-based wrapper. It may be served fresh or deep-fried as a side dish or as an appetizer during special occasions. 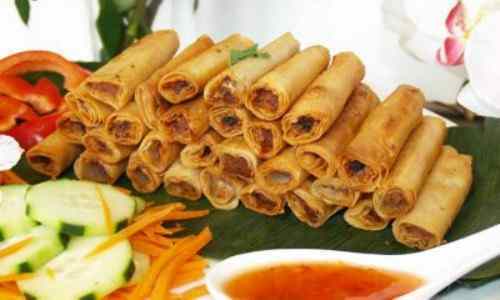 It is also a snack and street food among Filipinos. It originated in Fujian, China and brought to Southeast Asia by Chinese traders as early as 7-13th century in the days of the Srivijayan Empire (based in Sumatra) and later the Madjapahit Empire (based in Java) in 13-16th century. Over time, it crawled into the Filipino mentality of food preparation with modifications. Shanghai Variety - This is mostly meat-based and is much skinnier than the traditional one. It is one-half inch to an inch in diameter and approximately 4-6 inches in length. Hubad Variety - This is basically an unwrapped. Fresh Variety - This variety is not fried. It consists of shredded fresh vegetables minced ubod (palm tree trunk), flaked chicken, crushed peanuts, and turnips. 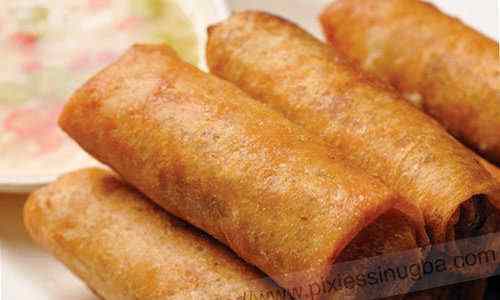 Fried Variety - This is fried spring roll. It consists of bean sprouts and various other vegetables such as string beans and carrots that are briskly fried. Small pieces of meat or seafood may also be added. It is the least expensive variant. Ubod Variety - This consists of ubod (the heart of a coconut palm). It is a specialty of Silay, Negros Occidental, where it is usually served without sauce. Bangus-Based Variety – It is basically a variant where red meat is merely substituted with bangus (milk fish) meat. 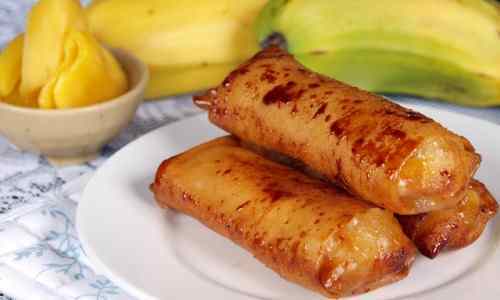 Banana-Based Variety - This is a dessert called turon in Filipino. It is a popular street food and snack made by thinly slicing pieces of saba bananas (ripe plantains) lengthwise. Stir in garlic and onion; saute lightly. Add water chestnuts, vegetables and seasonings; cook for about 2 minutes. Combine flour and water to form thin paste. To make rolls, place 2 tbsp filling on a lumpia wrapper. Fold neatly like and envelope. Head deep fat to 375 degrees F.
Combine remaining ingredients for sauce. Fry the rolls in hot fat until golden brown. To make sauce, combine vinegar, 1 teaspoon soy sauce, sugar, water, ginger and garlic in small saucepan. Bring to boil. Stir in cornstarch paste and simmer 5 minutes, or until thickened. For the fillings, mix pork, shrimp, mushrooms, jicama, green onions, egg yolks and 2 tablespoons soy sauce in bowl. Shape about 1.5 tablespoons meat mixture into strip and place along one side of wrapper. Roll tightly, folding in wrapper ends while rolling. Moisten edges lightly with water to seal. Combine sugar and cinnamon in a bowl and coat bananas with the mixture. Take 1 spring roll wrapper and place 1 banana strip on bottom “a“ of wrapper. Fold in left and right side and roll up from bottom. Deep-fry on each side until golden brown. Lumpia can meet your simple-to-elegant gauge for a Filipino recipe. 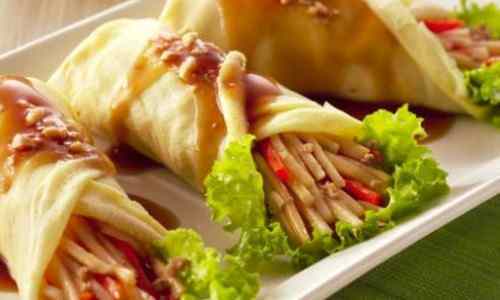 It’s a great spring roll dish that can pamper you any time of the day. It gives you an easy foodstuff to pick on the table or outdoors. The early Filipinos learned it from the Chinese traders as far back as the 7th century. It is a side dish or as an appetizer during special occasions. Want to try to prepare it? Want to SEE, LIVE or INVEST in the Philippines? Well… decide and come.